Hailing from the city of Birmingham in England is 8-year-old gymnast and model Daisy-May Demetre, who was recently announced as the face of River Island’s kidswear campaign. Demetre had both of her legs amputated at 18 months old due to a condition called fibular hemimelia, which causes a stunting of growth in the fibular bone. Despite her condition, she frequents the gym with her father, plays soccer and is signed with Zebedee Management, a modeling agency that scouts talent with disabilities. “It was heartbreaking. Her feet never formed properly, one came out like a ball and the other was very flappy,” her father told Daily Mail. The operation took eight hours to complete and resulted in Demetre having prosthetic, blade-like legs. A spokesperson from River Island told the Huffington Post U.K. that she fits the bill, given her vivacious personality and passion for sports. “For the new RI ACTIVE range for girlswear, we required a model who has lots of energy and who looked great in activewear,” they said. “Daisy-May Demetre fitted this brief perfectly.” Demetre sports floral ensembles in her photos with River Island. Aside from modeling for the activewear brand, Demetre has also walked the runway during London Fashion Week and been photographed for other stores. According to her father, Demetre wants to do what other people can do. “She’s inspirational, full of energy, nothing will stop her ever in life. 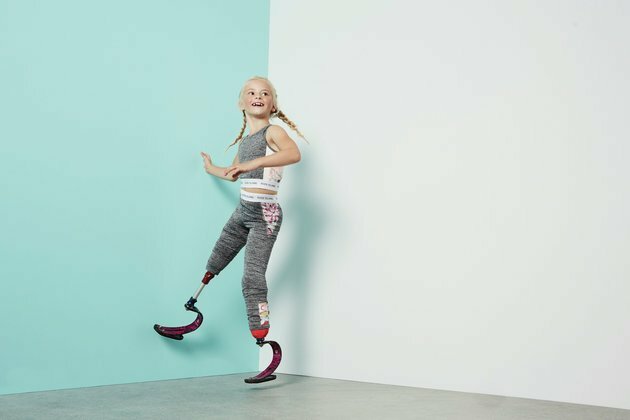 She’s going to be the most famous double amputee on this planet – there’s no stopping her,” he said.